This home is so clean and spacious. There are plenty of extra towels and sheets. The back yard was well kept and had a nice BBQ. The kitchen was stocked with everything needed for cooking plus there was coffee and some other necessities as well. Great cottage and really enjoyed all of the natural light. The bed was very comfortable and the cottage layout was great. Well be back! Mere minutes by car, the house is ideal for guests who plan to hit the slopes of Big Sky. We enjoyed every minute of our stay. Returning to the house after a day of skiing was a pleasant experience. So comfortable and welcoming the house offers all the facilities (or more) that a guest wishes. We worked with Zach when booking our reservation. He also handled a minor problem we had with the garage door right away. It was very easy to get ahold of the team. The owners have anticipated all of their renters' needs. We appreciated how easy the kitchen to work in and how lovely the master bedroom/bathroom space was. All of the furniture was comfortable and everthing seemed brand new. Centrally located, comfortable condo. We enjoyed our stay at this property very much. It is centrally located between the ski mountain - Bridger Bowl and downtown. The decor was appropriate western, but not over the top. I love to cook and found the kitchen had everything I needed to make a fine dinner. The livingroom was very comfortable and we enjoyed spending time in front of the gas fireplace. I would recommend this property to anyone with a small family or even two couples who want the privacy of sweet neighborhood but access to all Bozeman has to offer! House more than met expectations. We had a wonderful stay. Close enough for skiing and also hanging out in village/restaurants. Beds comfy - lots of space. Elk in backyard-stunning. We skied with a group. This was a perfect location. We loved the fully stocked kitchen and space to enjoy the company of our friends. This was a beautiful location for a rental cabin, however the road conditions were a bit dicey getting up to the start of the driveway and then up the drive itself. We have all-wheel drive, but a more heavy duty 4WD vehicle is probably ideal. We had a few questions and Zach from StayMT was extremely helpful and responsive via text. The views are absolutely phenomenal up at this house. We had a blast XC skiing in Yellowstone, soaking at Chico, the Boiling River (and in the hot tub at the house) and exploring Livingston and Bozeman. Awesome trip! Great townhouse! well equipped kitchen, baseboard heat with individual zone controls in all bathrooms bedrooms and living areas which kept the house nice and warm! Another perk to this rental is location very convenient to restaurants and shopping and not far from slopes! Wifi has been added as well. We loved our stay in this beautiful, cozy home near Hyalite which is also only 10 minutes from downtown Main Street. From every window you can see an ominous Montana mountain range. 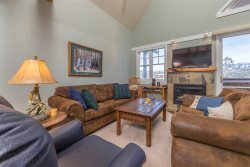 While having a private, secluded feel, the house is located very close to points of interest within Bozeman. The open floor plan of the house felt spacious and comfortable. The decor felt professionally done and made us feel like we were in a cabin in the woods. Little fun touches like New Year's Eve hats, confetti and sparkling apple cider showed care for making guests feel welcome. The home was also immaculately clean. Having stayed many times in Bozeman due to my daughter attending college there, this was definitely a favorite place to stay and we would definitely stay there again.